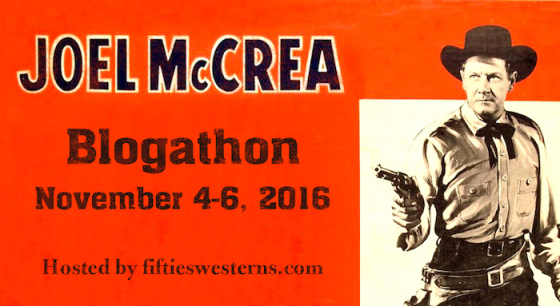 The Joel McCrea Blogathon is hosted by Toby Roan of 50 Westerns of the 50s. Click HERE to enjoy all the contributions to the celebration. 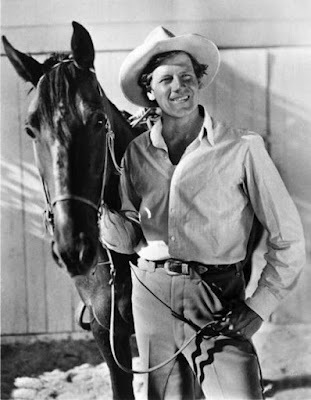 Handsome and athletic Joel McCrea entered the movies as an extra in the late 1920s and by the early sound era he was proving himself a valuable and versatile young leading man. Dramas include The Lost Squadron, These Three and Dead End. Adventure films such as The Most Dangerous Game and Bird of Paradise. A leading man adept at comedy, McCrea showed his chops in Woman Chases Man, The More the Merrier and the Preston Sturges classics Sullivan's Travels and The Palm Beach Story. Along with Sturges, top flight directors George Stevens, Alfred Hitchcock, William Wyler, Howard Hawks, C.B. DeMille and William Wellman knew what a treasure they had in Joel McCrea. The man who listed his profession as "rancher" instead of actor was also particularly at home in the western. Early in his career the opportunities in that genre were surprisingly few, but of top quality including Barbary Coast, Wells Fargo co-starring wife Frances Dee, Union Pacific, The Great Man's Lady and Buffalo Bill. Today's focus is on The Virginian. After playing the title character McCrea would turn his attention exclusively to westerns. Even his cameo in Hollywood Story indicated by costume that actor McCrea was involved in the making of a western. Owen Wister's 1902 novel The Virginian is a story, as they say, with legs, creating template basis for many of the western based stories which followed. Shortly after its successful debut the story was adapted as a play by Wister and Kirk LaShelle that ran on Broadway twice, in 1904 and again in 1905, both times starring Dustin Farnum in the title role. Farnum would recreate that role on screen in 1914 in one of Cecil B. DeMille's early directing forays. The film packs the story of the maturing of a good-natured youth through love and tragedy into a brisk 54 minutes. Less than a decade later, the story would again hit the screen starring Kenneth Harlan and Russell Simpson (The Grapes of Wrath) as villain Trampas. Sound came to the movies in 1927 and to The Virginian in 1929 with Victor Fleming directing a dream cast of Gary Cooper as The Virginian, Richard Arlen as the feckless and doomed Steve Andrews and Mary Brian as Molly Wood. Walter Huston is an outstanding Trampas. Sounds of a cattle drive and singing are heard over the opening credits, but the rest of the film is scoreless. There is however some nice use of sound in touches such as the clicking of a gun barrel and the whistle of a quail. PS: There's a George Chandler sighting for those into that sort of thing. It is not a surprise that Paramount would revisit the story in 1946 and feature McCrea in the lead. The screenplay was by the team of Frances Goodrich and Albert Hackett, the well-regarded team behind It's a Wonderful Life, The Dairy of Anne Frank, The Thin Man and Seven Brides for Seven Brothers. Their version was adapted from Howard Estabrook's screenplay for the 1929 film. Estabrook was a former actor and prolific screenwriter who won the Oscar for Wesley Ruggles' 1931 version of Cimarron. Other notable titles include Hell's Angels, David Copperfield, The Shopworn Angel and The Human Comedy. McCrea was 40 when he was cast as the Virginian. His maturity shows, but not to a disadvantage. While we don't see the onscreen antics that bond this "man with no name" and his friend Steve we understand it through their interactions. Sonny Tufts plays Steve and, as he could from time to time, acquits himself quite well in this important supporting role. A dreamer and a follower, Steve is led into a life of crime by Trampas which leads to tragedy for the Virginian and his friend. The "smile when you call me that" scene. Brian Donlevy often played sympathetic or comical characters, but when he came up against McCrea there was always onscreen conflict in Barbary Coast, Union Pacific, and The Great Man's Lady. Donlevy as Trampas is as nasty and craft as they come, and dressed all in black just so we don't miss it. Barbara Britton makes an attractive and feisty Molly Wood, the Vermont born schoolteacher who travels west for adventure. Her stubborn pride almost gets in the way of the romance that comes her way, but the Virginian is just as stubborn so this part of the plot plays out as it should. Barbara Britton would find herself a TV pitchwoman in the 1950s as well as starring in Mr. and Mrs. North with Richard Denning. Her film career includes Champagne for Caesar, the 1955 version of The Spoilers, I Shot Jesse James, Cover Up and Gunfighters, Albuquerque and Captain Kidd with Randolph Scott. The Virginian was the first feature directed by Stuart Gilmore, Oscar-nominated editor for The Andromeda Strain, Airport and The Alamo. He would return to that career after directing four other films in the early 50s, four westerns and the B sci-fi classic Captive Women. Gilmore directs a who's who of supporting players including Fay Baiter, William Frawley, James Burke, Joe Crehan, Henry O'Neill, Tom Tully, Paul Guilfoyle and Marc Lawrence. The Virginian was filmed in startling Technicolor, as was Paramount's way at the time. It makes for an almost hypnotically beautiful film, but in some ways also sanitizes the grit that could be found in the story. Nonetheless, The Virginian always holds interest for an audience no matter how familiar with the tale. Joel McCrea is particularly appealing in the role and the movie holds a special place in his filmography as the stepping off to years of satisfying western entertainment for generations of fans. PS: There's an Esther Howard sighting for those into that sort of thing. I mentioned the story had legs, didn't I? We can also enjoy a 2000 Made-for-TV version directed by and starring Bill Pullman. James Drury, star of the popular television series adapted from the novel (1962-1971) makes an appearance in this one. There is a 2014 video re-imagining starring country singer Trace Adkins and Ron Perlman as Judge Henry. The IMDb also has the title listed in development. "Hypnotically beautiful." That's the perfect way to describe it. I'm doing a post on South Of St. Louis, which has Technicolor just as pretty. Alexis Smith looks like she'd glow in the dark. Thanks for being part of the blogathon! My pleasure. Wouldn't have missed it. Looking forward to your South of St. Louis piece. I would stay up late, even on school nights, to watch that one and listen to those little bells. Thank you for the thorough rendition of the multi-format history of this work of art - from novel, to play, to cinema. I really enjoyed this piece and found it inspiring. 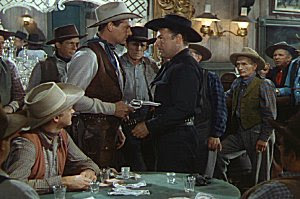 I had planned to watch a McCrea movie tonight either Colorado Territory or The Outriders - instead because of your post I am going to watch both the Gary Cooper & Joel McCrea versions of the Virginian. I'm so pleased you are going to watch, compare and, I hope, enjoy the versions of The Virginian. Colorado Territory is one of my favourite McCrea pictures. I like it even better than Walsh's earlier take on the Burnett story, High Sierra. I haven't watched The Outriders in many yeas so that you for that inspiration. A very well researched piece,a great read. especially for that gorgeous 40's Technicolor. poverty row flick CAPTIVE WOMEN. called in a favor to get his directors "ticket"
I recall Clarke's comments on Captive Women and agree this is an oddity in directing side of Gilmore's career. I don't know who might have been pulling the strings, but I had a fleeting thought that all those character actors subversively put the whole thing together. Who knows better how to make a movie work? Very fine piece of writing, Caftan Woman (as always actually). It is a very enjoyable film and McCrea was great in it of course. Perhaps the most important thing about it in a way is that it was the film that kick-started his exclusively western career thereafter ("Rough Shoot" aside). It amuses me that Trampas - so mean and evil in the book and all the film versions - morphed into a handsome and humerous nice guy in the TV series. How could you not like Doug McClure?! Jerry - agree with your point about the Trampas morphing because my first exposure was the TV series- I'll try the book one day - almost always my preferred starting point - one exception if the Hopalong Cassidy genre where I just couldn't get into the books - the original ones anyway by Clarence M - have no trouble with the Louis L'Amour ones. My starting point for The Virginian was the TV show, but I easily accepted Trampas as a baddie after I read my Classics Illustrated version of the story, later moving on to a well-worn paperback in my teens. I can only think of Hoppy one way, and that is the William Boyd style. Thankfully, there are other books to read. 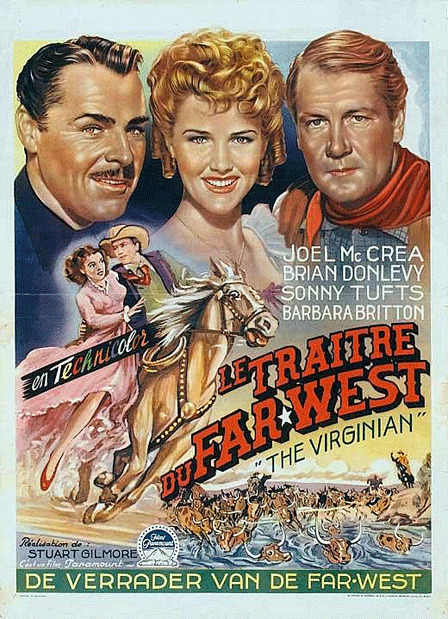 Count me another who started with the television series as my template and was surprised to find Trampas a villain in the novel (which I came to in my late teens)...In any case, Brian Donlevy in black sounds like a perfect Trampas and McCrea is, of course, easy to imagine as the Virginian. I'll definitely be on the hunt for this one in the near future. Thanks for the history lesson Patricia! Strolling with The Virginian was great fun for me. Donlevy had that cold villain bit down pat. It is an enjoyable movie and I hope you get a chance to see it soon. 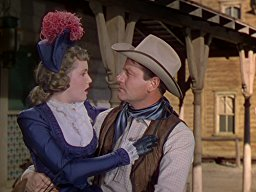 My mother loved Joel McCrea and I think THE VIRGINIAN was one of his most iconic films. Glad you mentioned Barbara Britton, too, as she was indeed charming in CHAMPAGNE FOR CAESAR. Moms know the good stuff! Barbara Britton is a charming presence indeed. Lovely overview of this very attractive film and its source. Like others, the TV show was where I first heard the name and knew of the characters so the idea of Trampas as the bad guy came as a bit of a surprise to me too. Actually, this reminds me that I've never read Wister's novel - that something else to add to the "to do" list. "To do" lists never end, and aren't we glad. It has been a few years since I read the novel, but I did read it more than once and enjoyed it. Thank you for the charming compliment. I'm glad you got this one covered and enjoyed your sympathetic take on it. I've seen it several times, and truthfully I like it better than the famous 1929 version directed by Victor Fleming (have also seen silent De Mille version). It may have something to do with the genre beginning to truly flower in 1946, which has a subtle effect on the whole, and also because of McCrea, who is more mature as the hero than Cooper back in '29 and that works for it and really to me he is more ideal for this role. Considerations of Stuart Gilmore as the director are interesting--he didn't make as much of a career as director as he had as an editor--and I'm not sure Paramount didn't just give him this with the understanding that he'd just do a Technicolor copy of Fleming (I think a lot of it is pretty close in the images but haven't seen them close together). But there really never is a copy, there is always inflection in so many ways, beginning with the actors and really in so many things. So I don't think one can count out Gilmore or deny him credit for it if one likes it, as I do. There is no doubt that McCrea's acting skills and experience at this time bring so much to the role. He is so subtle, so layered and so watchable. I don't like to take credit away from anyone. Stuart Gilmore certainly had great material and a strong ensemble cast in this effort. I'm sure everyone pulled together and the result is an extremely likable movie. That it didn't translate into a better and more prolific career in that field may just be one of those things. Hollywood is not particularly kind. I find it fascinating to compare the different film versions through the years. I'm starting to wonder about that one the IMDb says is "in development". It's been several years since I watched this and you make me want to go back to it! Especially as I've come to appreciate the supporting cast (including George Chandler, grin) more in the ensuing years. I hadn't considered before how often McCrea and Donlevy faced off in movies! The color is indeed stunning -- I think you have an interesting point about it "sanitizing the grit." Incidentally read the book several times, but not for many years now...having first met the characters in the TV show it was definitely confusing to discover Trampas was the villain of the piece! My, how we all love the TV series, and how it skewered our view of Trampas! PS: I've always thought Doug McClure would have been a good La Beouf in True Grit. What do you think? It's been ages since I saw it (likely first on our--was it Lone Star? channel) but clearly remember loving it. After reading this and being in the McCrea mood I'd love to revisit. Great movie and wonderful reading as always! Thanks. I don't think there's ever a time we're not in a Joel McCrea mood. I was so happy when we got Lone Star. Then they started showing cop pictures as if there weren't enough westerns in the world!